The memo says people in the White House should leave their old grudges with the media behind… But also that they should never forget. Former White House communications director Anthony Scaramucci speaking to members of the media at the White House. A DETAILED MEMO written by Anthony Scaramucci reveals he had big plans for the White House communications team before he was dramatically fired. Scaramucci, who lasted 11 days in the Communications Director role, set out his vision for the department in a document titled ‘Communications plan’. “Everything is possible with a good culture, nothing is possible without it,” he notes in the “improving the culture” section. He advocated that team members “build bridges and foster better working relationship” with members of the media. POTUS can choose to fight with the media, but Comms can not. “WH [White House] should leave old grudges behind, but never forget,” he ominously added. The document is littered with corporate speak such as “Implement a series of professionalizing initiatives immediately” and “Upgrade talent incrementally — prioritize culture”. Make it clear that horn tooting and denigrating colleagues is unacceptable. Scaramucci’s admiration for his former boss shines brightly throughout the document. He refers to Trump as “the best golfer to serve as President” and the “greatest TV star in history”. The investment banker did have some ideas that would be welcomed by journalists the world over. He said that no communication staffer should go home before returning all calls, emails and texts. “People may not like our answers – but they should always be treated professionally and respectfully,” he wrote. The apparent obsession with leaks, that seems to have permeated throughout the Trump administration, is comprehensively addressed in the document. “No more threats about leaking and internal game playing – anyone who takes actions that do not serve the President will be dismissed – period. Scaramucci went into great detail outlining how he views the communications department as a customer service operation, with the president as their number one customer. He spoke of a need to “humanize” the president and “burnish” his image. He put forward the idea of a lottery for the chance to play golf with Trump as a way to do this. Scaramucci describes how the department needs to operate like a news channel complete with producers, scripts and narration. “An effective Comms shop will dictate the news of the day on most days,” he states. Comms needs to better explain how POTUS’s actions are helping Americans. For example, deregulation is an abstract concept to most voters. He detailed plans for the White House to increase the amount of “visual, video and graphical images” that it produces so it can control the news cycle. This would include Trump regularly writing op-ed pieces for major publications, taking questions from real citizens via Facebook live and “modernized fireside chats” where POTUS sits with a Cabinet member or senior official to discuss the relevant issues. The plan was published last night by right-wing media personality Mike Cernovich. 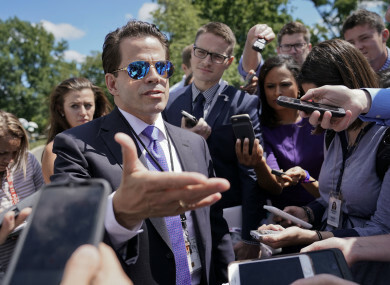 Intriguingly, though perhaps not accurately, Scaramucci’s scorching hot career as a newsmaker may not be over. 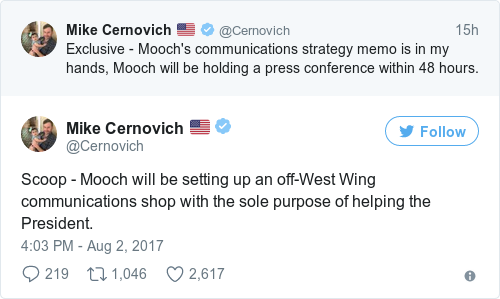 Cernovich tweeted that, following his firing, Scaramucci will be setting up “an off-West Wing communications shop with the sole purpose of helping the President”. He added that Scaramucci will announce the news within two days. Email “'We will eliminate the bad eggs': Document reveals Scaramucci had big plans before spectacular firing”. Feedback on “'We will eliminate the bad eggs': Document reveals Scaramucci had big plans before spectacular firing”.